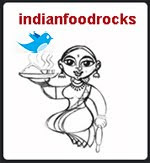 Indian Food Rocks: Holy Bananas! It's the Big Four Oh! Yes, that's me! And that was 39 years ago. I hit the big-four-oh today and I am on a new high. At least I think I am. I have to be, especially after going through a long period of "just what have I achieved in my life so far" and "where am I headed." I would be lying if I said I have things under control and that I know where I stand! My life did not pan out the way I thought it would. I was never quite the size 1 lissome supermodel, nor the powerful and intellectual CEO of a company that changed the world, nor did I ever become a Nobel Laureate. Actually, no-one's ever heard of me. And I don't mind because I don't think I have it in me to bear the burden for others, to shine the guiding light and carve the path ahead. I do have my sphere of influence where, no matter what, I know that I make a difference. 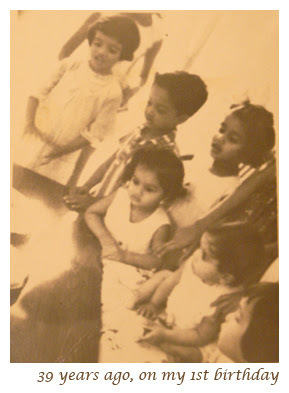 I dug out some of the very few pictures I have of my childhood cos I am in a sepia kind of mood. My parents used to kid me that this young man was my first love. The next two pictures are taken in Kolhapur, Maharashtra. I was not quite 2 years old. I don't remember the cutie's name but it's pretty obvious that he didn't much care for me! Heartbreak at two! Cruel, cruel life! This picture below was taken in Bombay, now Mumbai. Didn't everyone have a papier-mâché model of the mascot of Air-India? Almost everyone I knew had a relative in Air-India. And almost everyone had the Maharajah taking a deep bow on one of their bookcases. And that transistor radio! I loved to fiddle with the big knob that changed the stations. 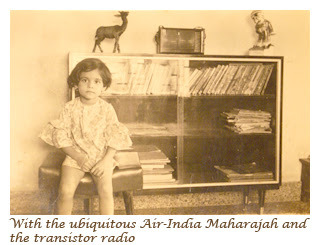 Was there any other radio station besides All India Radio with their Vividh Bharati service at that time? Does anyone know or remember? It was just one of those tangential thoughts that arose through all this introspection I have been doing. My conversation with Medha last evening was very interesting. I told her that it was probably the last day of the first half of my life. She started negotiating with me - maybe it's the last day of the first third or better still, the first quarter of my life - as though I had some control over it all. When I told her I didn't want to live that long, she said she never wanted to have to do without me. But, I pressed on, there would and should come a time when she will not need me anymore. She thought a while in deep silence, her brow furrowed, and then said, "Mumma, I may not need you but I will want you!" Sweet! That is where I want to be. Wanted more than needed. If we ever get there, it means that there will be at least one job that I will have done well. I am quite sure that today will be a normal / business-as-usual kind of a day. But it is an important milestone. Technically I am 'over the hill' but, as my friends tell me, there is a whole new life on the other side. I certainly hope so! We don't have plans for today except to make Glazed Bananas with Ice cream for dessert. The rest of the day will pan out just as life has, moment by moment and no regrets. Heat butter in a small skillet until melted. Add brown sugar, cinnamon and orange juice and cook till it simmers. Stir frequently. Cut bananas in half lengthwise and then cut into 1 inch pieces. Add bananas to the juice mixture and cook for 3-5 minutes, turning as needed to coat the bananas well with the mixture. This is a really simple dessert that is out-of-this-world delicious. My brother-in-law served it to us when we visited them earlier this summer. It was the perfect antidote to the Goa Prawn Masala that had us on fire. He said it was a recipe from a local newspaper. I don't have a picture for you because Medha and I will be making this later tonight. If I take a picture, I will update this post with it. If not, just imagine the flavors as you know them all very well and feel the warm bananas in your mouth as it mingles with the chill of the ice-cream. I know my day will be great! I hope yours is, too! Just don't ask me for pearls of wisdom. I am only turning 40. Not 80! It was very difficult to take a picture of this dessert. I did not chill the bowls and when warm glazed bananas met cold slow-churned vanilla ice-cream, I was looking at a white pool of ice-cream! But this was a wonderful treat and a great way to celebrate on a schoolnight. I am sending this to Mandira, the warm and gracious host for JFI: Bananas. Happy Birthday Manisha! You'll never be over the hill... coz the hill keeps growing with you. What a beautiful post to celebrate your birthday - have a great Four-Oh-th! Such lovely photos M. If this is the way you think you will always be young at heart. Have a wonderful birthday and a great year ahead. To be 2 and to be in love. Aaahhhh..
That pictures are too cute. Happy birthday, my dear friend. Happy Birthday Manisha. Such a sweet post and you are looking at your 'first-love' so lovingly. Your daughter is so sweet.. what a wonderful think to say - am sure that it was the best gift ever - to hear her say that. Happy four-oh! once more :). Enjoy the day and each day to follow. Have a great day and a wonderful year ahead! And Medha's remark is so sweet! and so true! 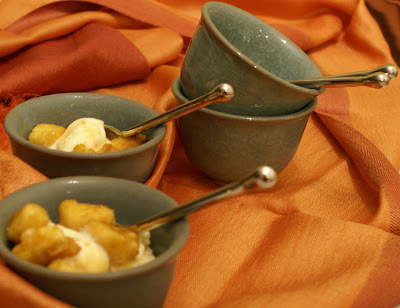 and the glazed bananas with ice cream sounds ideal for the occassion :). Happy Birthday,Manisha!! Here's wishing you many more in the years to come. Many happy returns of the day manisha!! Great memories and an amazing icecream to scream for!! Happy BirthDay Manisha. 40 is the 20 after you have achieved adulthood, so you are an young adult. I anyway keep decreasing my age by an year on every birthday, the scale shouldn't just go up. I loved what Medha said, very profound "To be wanted, not needed"
Welcome to the good times of 40s.I entered that about 3 yrs ago!! Isn't 40 the new 20? (or it is the new 30)...anyway just a number. happy birthday, darling!! you share your b'day with gandhiji and lal bahadur shastri? that's neat. as for that boy in the pic? you're too hot for him. Happy Birthday Manisha. Lovely Pictures your are very cute. We recently recd a bday invite that read," Celebrating the 40th anniversary of my 20th bday"!!! :) You have another 20 years before you can say that! A very happy bday to you and enjoy your day! The banana dessert sounds fabulous...quite like the Southern US "Bananas Foster". P.S: That was a deep conversation you had with your 8-yr old! But it is traumatic for kids that age (or really, of any age) to come to grips with the idea that their parents are mortals. Her response was too sweet. I liked the way you looking at your first love. Cute! Wishing you many more happiness in the years to come. It was Vividh Bharti & Bombay A in those days produced by All India Radio. dear manisha, vadh-divasa nimitta hardik subhecha! Thank you all very much for your wonderful wishes! You made my day! Saju, try the dessert and let me know if you like it. It's made in a jiffy! ET, it's been a great day so far! Ashwini, young at heart and mature of mind - hopefully! Gini, I was totally besotted! I only remember his last name though. Laavanya, her gifts keep getting better and better. When she left for school this morning, she asked her Dad what dispensable meant again and if the opposite is indispensable. She's going to make me a card, I know it! Sig, I doubt the poor fellow even remembers me! The last I heard he was doing very well for himself. I just wish I remembered his name! Shankari, I hope you get to meet her, too! She can be quite entertaining once her initial shyness wears off! Musical, we may still have that radio. I must look when I go back to Bombay next. All I can do is give Medha the inputs we feel she needs. How she processes them is based entirely on who she is. And so far, all I can say is that I am very blessed! Roopa, I think it does! TBC, I'll raise a toast to that! Padmaja, I am tempted to pour some rum over it and light it. Let's see! Sandeepa, what about the weighing scale? Sigh! One's metabolism slows down! I actually eat less but still put on weight! And Medha comes up with these nuggets from time to time. Let's hope she retains some of this wisdom in the upcoming teen years! Asha, I'm in good company! TC, currently it still feels like a number. Although I showed my sister some nasty looking veins over summer, hoping that she would give me a magic potion to get rid of them. She just sighed, shook her head and said: "Aging body!" Ouch! Girl Wanders, welcome to the party! Oops! That's Anita's tag line! Welcome to my birthday party and IFR! Rajitha, they start younger these days! Recently when I was travelling, I got a frantic call from Medha saying that a boy in her class likes her. And it was not just like but 'like like.' She was horrified as she hates all boys right now. That, too, will change. Bee, you're another one! Astro-twins, we all are. BTW, I heard that he grew up to be a handsome fellow. I don't think I ever met him again or if I did, I don't remember! Our fathers were friends and colleagues. Nabeela, I'd like to take all the credit in the world for her but she is her own little person with her own distinct personality. I like to believe I am helping mold it but you know what? I think she molds me instead! Jyothsna, I like that! I hope I remember that when the time comes! Nupur, I thought of you last night. I have a picture of a bunch of women, some young girls and a few of us toddlers. I think you may recognize someone from that lot. I'll take a pic of it and send it to you by email. It's been rather traumatic for Medha since her grandfather died less than 2 years ago. She soon developed a fear that she will lose one of us soon. We prefer to address it and reassure her that she will be taken care of no matter what and that she will be fine. It seems to help her. RP, wasn't he the cutest?! SamCollins, i knew someone would know! That same radio broadcast all the air-raids and blackouts during the war with Pakistan in 1971. Suganya, I can't believe it either! On the one hand, I feel where did all those years go? On the other, it's been a very long life. Richa, [big smile]! And yes, the need to be needed is our own weakness. It's human nature and it's how we tie down our loved ones. Set them free and everyone is so much happier! Perhaps that is the biggest pearl I have learned along the way. Sig, my husband took me out to my fave teahouse in Louisville for brunch and we were talking about turning 40, what we need to change in our lives from the perspective of living healthier and so on. As soon as I uttered change, he said: "Be the change that you want to see in the world." And my hand hovered dangerously over the pepper shaker... but that quote is just so perfect for what I need to do! Be the change. Thank you, Gandhiji. WOW. Excellent post and a very happy Four-oh-th to you, Manisha. Very introspective but very much on the point. I know for fact that "sphere of influence where, no matter what, I know that I make a difference." definitely applies to how much I know you through blogging. Btw,Not only do you share your b'day with Gandhiji and Shastriji, you also share it with my lil sis! Also, your b'day happens to be sandwiched between mine and my husband's. Ain't ever gonna forget your b;day, girl! Vee!, I knew it! You had to be a Libran, too! Should I be sending belated wishes your way or should I wait and wish you a Happy Birthday tomorrow? Then I can wish your husband the reverse! Please wish your sister on my behalf! I wonder if she went through the same birthday pains that I did! WISH U A VERY HAPPY BIRTHDAY!!! Medha is one lucky gal.. and may I also add, U r one treasured Mum!!! Hope u have a great day and a wonderful year ahead!! Belated wishes would be coming my way, M. My sis actually completely enjoyed her b'day being on a national holiday. She would celebrate at school and her friends on the 1st, I would celebrate with my friends on 1st and then there would a big family celebration on the 2nd to celebrate both our b'days. Then, everyone would tease us about how we should find guys that were born in and around that day. and, Lo and behold, I presented one to them. :D In fact, my husband still isn't sure whether it was him or his b'day that won me over. [grin] Ah, life. How was your day? Happy Birthday to the beautiful child who became a beautiful woman with a beautiful child of her own. Wishing you many more birthdays filled with love and happiness. Hi Manhisha, I wish you a very happy and joyous Birthday. I hope you had a lovely evening with your loved one. BTw your first love looks very cute! Belated Birthday wishes Manisha. Nice post and lovely nostalgic photos! Medha is a smart kid for her age! :)Hope you had a nice day. Happy birthday Manisha. Hope you had a wonderful day. Happy Birthday! Manisha. Didn't I read somewhere that first loves are always meant to be just that first love and nothing more. But you sure are very young at heart reading about you I thought you were in your 20s :). Hugs to Medha. Happy four-oh Manisha! Hope the next 40 are just as exiting as the last 40! -- Preeti. Wish you many many happy returns of the day. Thats a lovely writeup Manisha. Ohh D & u are lucky ones to have each other...what a lovely jodi :). So don't worry abt heartbreak ;). ok, now that your birthday is over, i can badger you. where's the picture? What sweet photos. Happy birthday! May your 40s rock. Wish u a Wonderful B'day Manisha!! your memories sound priceless! Happy Birthday. I love seeing picture and for u to share personal photos was great. Couldnt help but wish you. love, love the pictures! Thank you for sharing the memories and happy 40th birthday. Manisha..Belated Happy Returns of the day to you!! So You too share your bday with my Hubby!Hmmm...Reg the AI Maharaja,I too had it neatly placed on our showcase next to mini Taj Mahal! Good Old Mumbai!! 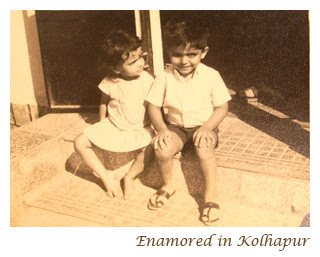 Hope to see the updated post and loved your childhood snaps completely!! Hv gr8 day!! Too often we go through life believing that we are "unknowns"... Our legacy on this earth is always greater than we imagine it to be! I'm a day late but nevertheless, Happy Birthday Darling. Here's to many more years of happiness, joy, good health and prosperity. Many happy returns of the day Manisha! That was a lovely read. And Medha is such a sweetie. I read your blog quite often, I love it. But today is the first time I am posting comment. And guess what it is not because of you but because of your daugther (though what she said was because of you)!! I loved what she said. I am not a mother yet but I hope my children will say that to me! Just kidding...sort of... :-) Anyway, celebrate for at least a week, and may it be filled with fond memories! Hope you had a wonderful time with your loved ones...yes, the hill is just in your mind...it's still a beautiful life and a wonderful world. Looks like the glazed bananas have had to wait? i love that picure. those bowls are gorgeous. did you make them? happy birthday (albeit belated !). celebrate one day for every year...its wonderful that you dug out those pix. b has been hounding me for some of my old pix - I have couple but apparently not what she is looking for! I've been swamped and I am also guilty of just enjoying myself a bit too much. Which is why this reply is so late! But the good wishes are truly appreciated and I thank you all for sharing my special day with me! To those of you who delurked, a warm welcome to IFR! Manasi, I hope she continues to feel that way! Vee, I should have learned to do what your sister did! But most of the friends I wanted to celebrate with were in my class and they came from all over the city. So celebrating on a national holiday was not really possible for me. And my teachers did not encourage celebrating birthdays on days when it was not your birthday. :-( So I was kind of stuck! But I am glad you guys made the most of it! Roopa, there's no way Asha is wrong! It's definitely been a fun week! Siri, you should see what pictures you can dig up and enjoy them all over again! Lee, that is so lovely! Looking forward to meeting you soon! Vidya, oh no! Not disaster! Do let me know! Laila, glad you enjoyed the pics! ISG, I wouldn't even know of him if it weren't for these pictures! I don't feel any different than when I was in my 20s. Except when my body won't move as quickly as I think it should! Medha is glowing from all this attention, I tell you! Preeti, if it's up to me, the next 40 years will be fun! Molly, I hope we get to meet soon! Shilpa, I was worried and concerned about you. There was no way I could not call. I wondered whether I might be intruding but decided to kick that thought aside and make the calls to find out how you were doing. Good health to you always, my dear friend! click, erm...Bee? Picture was slightly late but there it is now! The bowls are actually Japanese tea cups that were gifted to me over 12 years ago by a dear friend. I didn't dare use them all these years. Kitt, I hope so, too! Kumudha, glad the pictures touched a chord with you! Dhana, they are priceless! And we're making more memories every day. Mocha, if it makes more folks delurk, I don't min celebrating my birthday over and over again! But after a point, we won't keep count, ok?! Mandira, you are the best! Thank you again for the reminder and for accepting my late entry! Sirisha, a simple recipe that takes hardly any time to put together. Try it! Purnima, my astro-twins are coming out of the woodwork! I hope you and your husband has a good celebration! And yes, the mini Taj Mahal! Every family needed to have one of those! We got one that glittered when I was 7 or 8, when we took the Raja Travels' train from Bombay to Jammu, via Delhi. Kate, thank you! That is beautiful! Cynthia, the birthday week might just become a birthday month! And why not?! One does not turn 40 every year! Mamatha, yes, Medha is a sweetheart. I think I am very blessed! "Somewhere in my youth or childhood, I must have done something good..." is a song I sing all the time. I truly do wonder. Priyatama, I am glad you delurked! This blog is definitely more about Medha as our lives revolve around her. I can't wait till she goes away to college, then it will be about me! me! me! Sigh. Who am I kidding?! Pel, 1/3 translates into a l-o-n-g life. Possibly senile for the last 1/3! No thank you!! I should just delete your comment for that awful word you uttered. [shudder] Did you know durians are banned on airplanes? I need to lobby for its relative to be on the banned list, too! Anita, there you are! Glazed bananas were made but posted late cos I have been swamped. Medha comes up with these nuggets from time to time. She has us amazed. Just as she does when she displays behavior that is not quite so wise! Rahin, not from Kolhapur, no. But we spent a couple of years there and there are a lot of good memories (told to me, of course) and some very precious relationships - one of them being a close family friend who appointed himself my Godfather. Linda, yes! Life is good! I will hug Medha a little longer tonight! Thank you! Anjali, that red and white candy! Yum! Jai, I have one of those but there's no way I am putting that up on my blog! It's good to see ya! Average Jane, welcome to IFR! Thank you for the lovely wishes and congratulations to you, too, on this - you said it right - liberating milestone! Life is good at 40! Let me know if you make glazed bananas. I had the left-overs the next day over fat-free yogurt. The bananas didn't look all that appetizing but tasted good nevertheless! 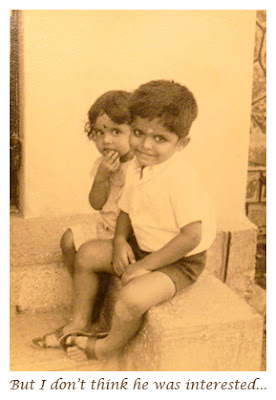 Dear manisha, Simply love the old pics...somehow they capture so much of an emotion, like old songs. Your transistor and photos were simply nostalgic to see. And whether four of forty, your blogging is so youthful and peppy, so there you go! Banana twist in an icecream is a real treat, and why not, this was a special day! cheers! Too late to wish you a happy 40th (!) but i turn 40 in October this year, and you can wish me instead. On AIR the Bournvita Quiz Contest was a favourite. With (was'nt it?) Amin Sayani.